Looking down I see the traces of those who came before me. Like an archeologist pondering his dig, I wonder what they mean. In the middle of a skateboard park, in the middle of suburbia, I laugh at my own pretensions. But then I realize that every mark is important. Each scratch tells a story. Each crack is an opening. I marvel at the beauty of a random universe. Abstract painting is easy…until you try to do it. Looking at the work of the great abstract expressionists I wonder where they found their inspiration. 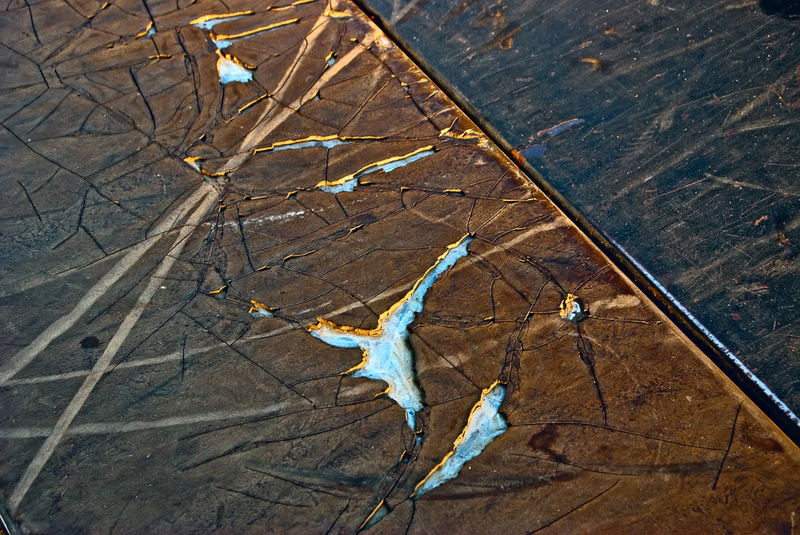 What if de Kooning or Pollock had seen these marks left by skateboarders? It's all about seeing, being open, going through the cracks to the other side. I pass this park most every day. From an aloof perspective it's a homely place, an indulgence. Once you make a designated place for kids to play, the play becomes forced. Kids want to skateboard in their own found places, not some fenced-in park that the adults deem the appropriate place. So the park is mostly empty. Yet, there are the traces of play. So, someone was here. I wonder who? Did the kids that once played here grow up and go away? Suddenly, I'm sad. Perhaps this was once a happy place of adolescent buoyancy. I, myself, have rarely seen anyone in it but my hours are not the hours of an adolescent boy. Hardly. So, the mystery deepens. I proceed to make up my own story of the marks. The park reminds me of Puff the Magic Dragon, a song that was popular when I, myself, was a young boy. I always found that song to be intensely sad, cloaked in the forced pretentiousness of 60's folk music. Jackie Paper, the cherished playmate of Puff grows up and disappears. He never returns to play with him. I always thought that Jackie was cruel, but, don't we all do that to someone in our life? We change. We move on. Someone gets left behind. The park was built in the middle of the Baby Boomlet. In our town, back then, it was all about the kids. And so they gave them a skateboard park. Now those kids are off in college. The park is left behind. Yet, the traces remain in the widening cracks of decay. Someday a town official with a clipboard will deem the park unsafe. Then they'll close it. Shut it down. One day, like poor Puff, the park will "...slip into its cave."